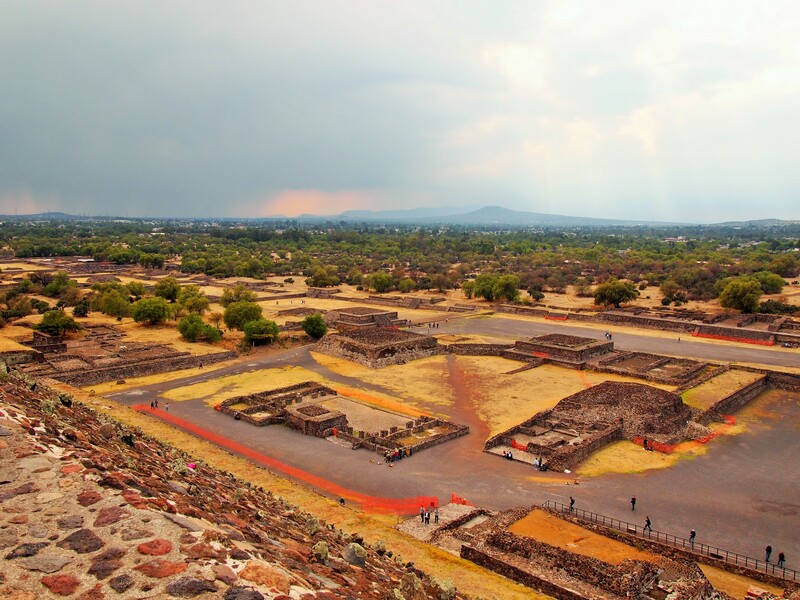 One of the top day trip destinations from Mexico City is Teotihuacán, one of the largest archaeological sites in the Americas and only 30 miles from the city. 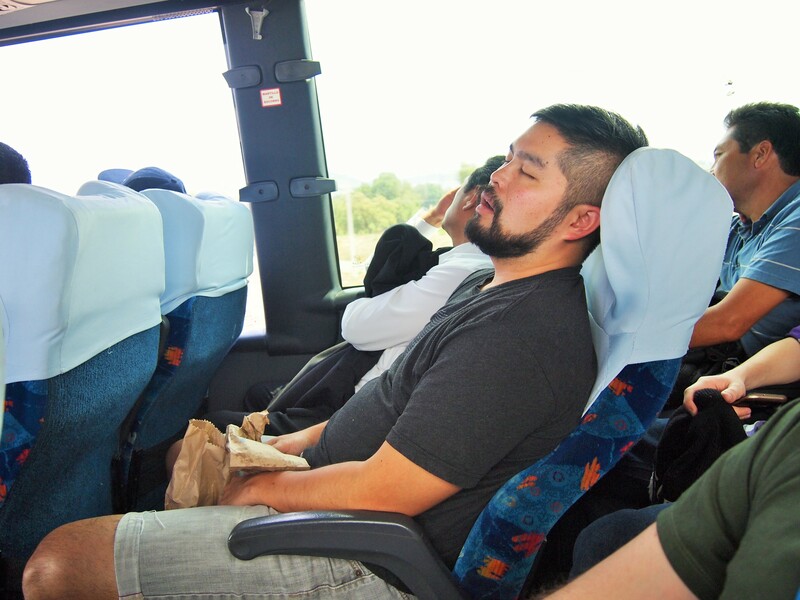 While there is a tour bus service (Turibus) which transports tourists from the Centro to the site, along with lunch and a guide (although the provided tour is in Spanish), we opted to do the trip on our own. We got a late start to the day but managed to reach the bus station in the northern part of the city around noon. 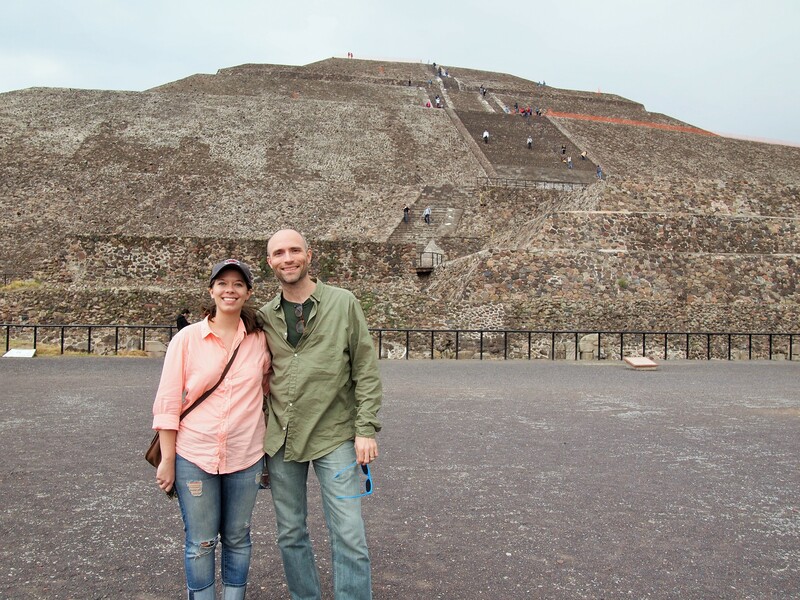 We bought our round-trip tickets for Los Pirámides ($5) at the counter for Autobuses Teotihuacán and hopped on the bus after going through security – a metal detector and x-ray scanner. 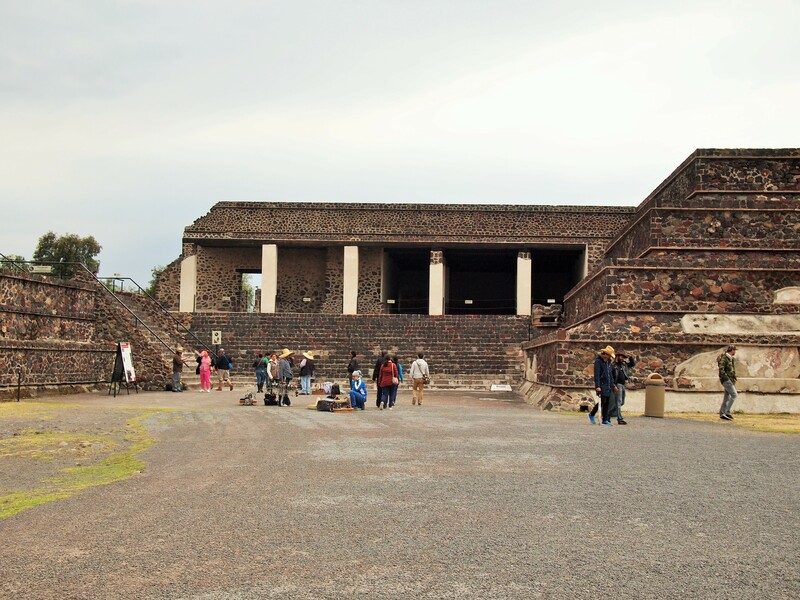 The ride out was fairly pleasant – there was a slight traffic jam into the city of San Juan Teotihuacán – and within an hour or so we were there. Almost as soon as we arrived we noticed a large dark cloud moving toward us. None of us had dressed for rain – quite the opposite really. We were prepared for the sun to beat down on us. I looked at the map and decided we should go to the museum to wait out the rain. We didn’t make it in time and we arrived to find that the museum was closed and being renovated. 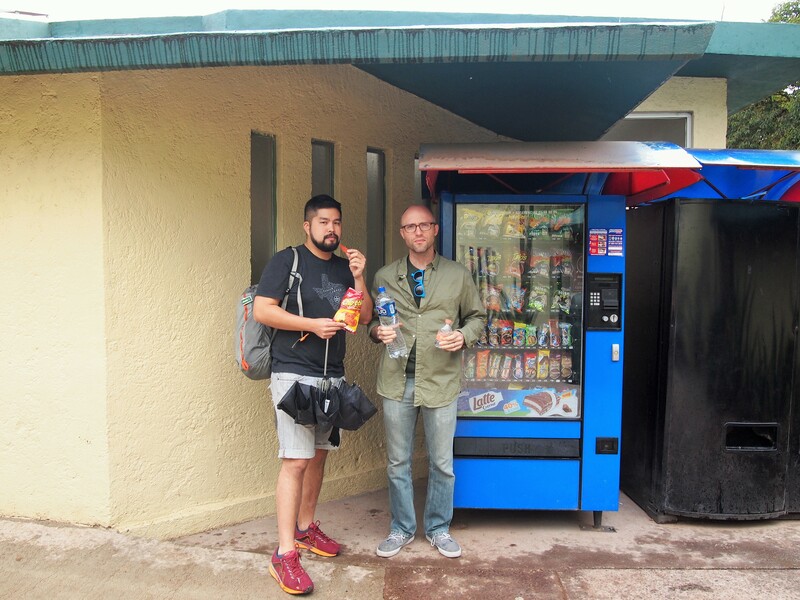 So we took shelter next to the vending machines under the roof’s overhang. 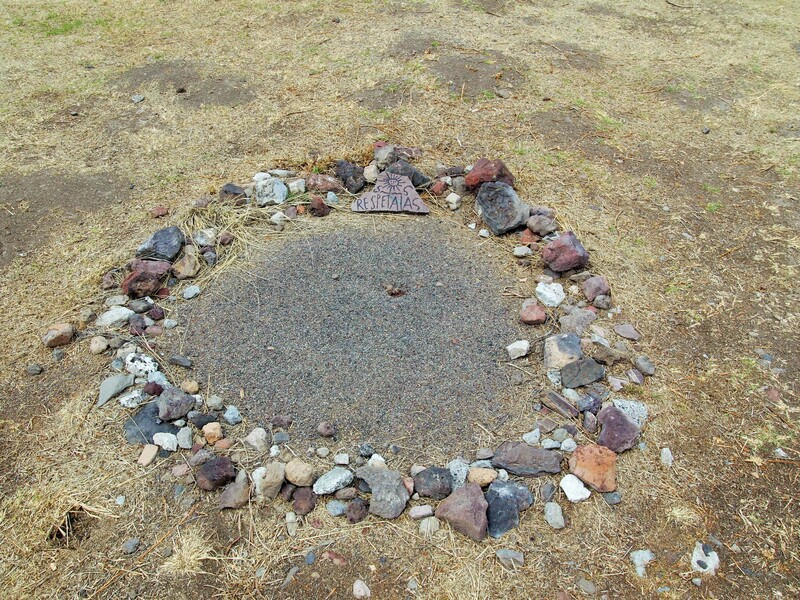 Luckily the rain didn’t last long and we were able to tour the site in dry clothes, albeit a little cold at times. 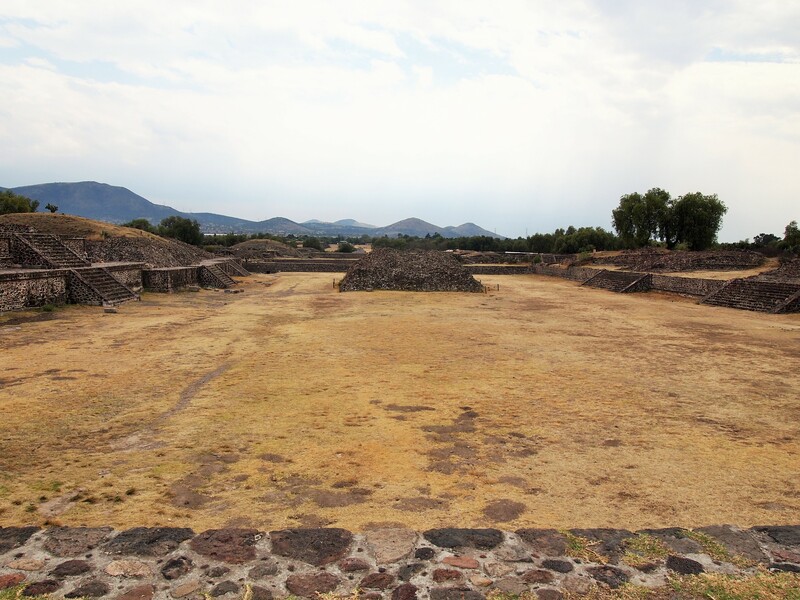 Much about Teotihuacán is a mystery. It is unknown who built the city, what they called it, or why it was abandoned. 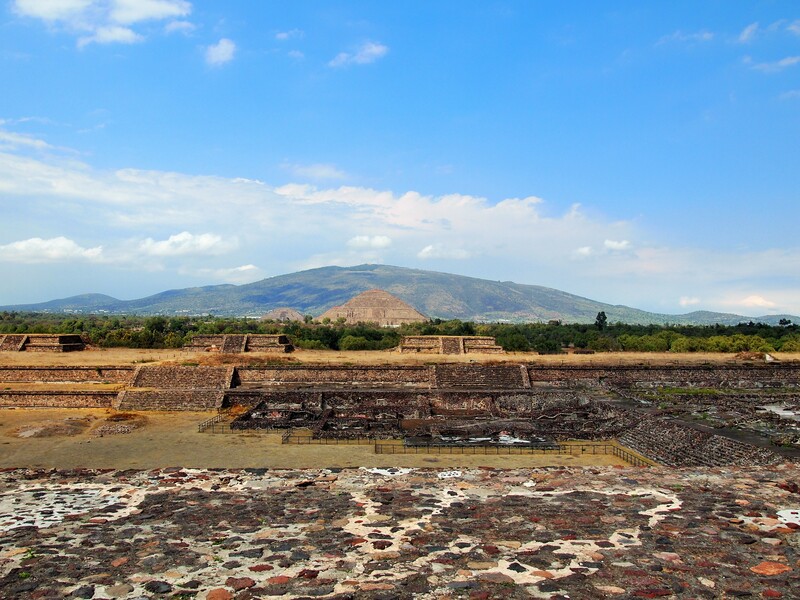 The Mexica discovered the city and named it Teotihuacán – Nahuatl for “the place of the gods” – intuiting that it was a special and sacred place. The city was built between 100BC and 650AD and archaeologists estimate that at its height it had a population of at least 100,000 and covered 8 sq. miles. 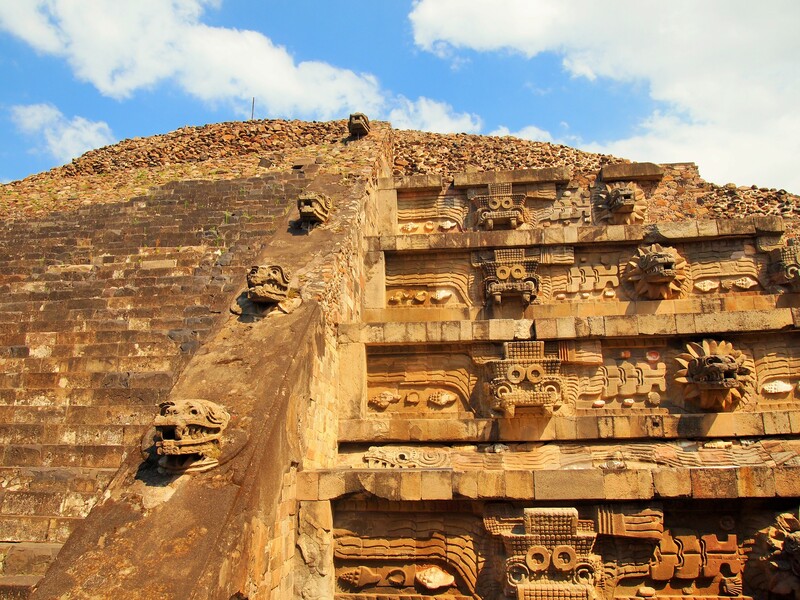 What remains of Teotihuacán is still quite astounding. 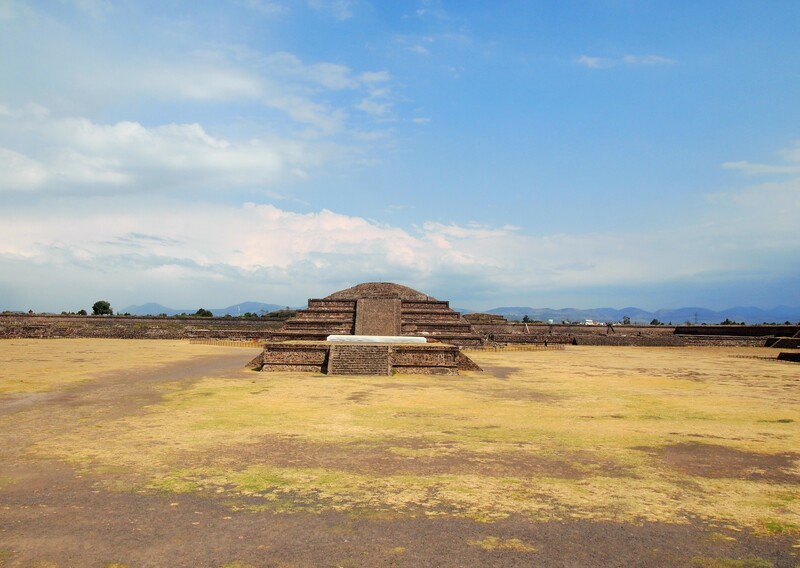 There are two pyramid temples – Pirámide del Sol and Pirámide de la Luna – along with La Ciudadela which contains the Templo de Quetzalcóatl, the Palacio de Quetzalpapálotl with the Patio of the Jaguars, and the Calzada de los Muertos. We began our journey with the Calzada de los Muertos (Avenue of the Dead). 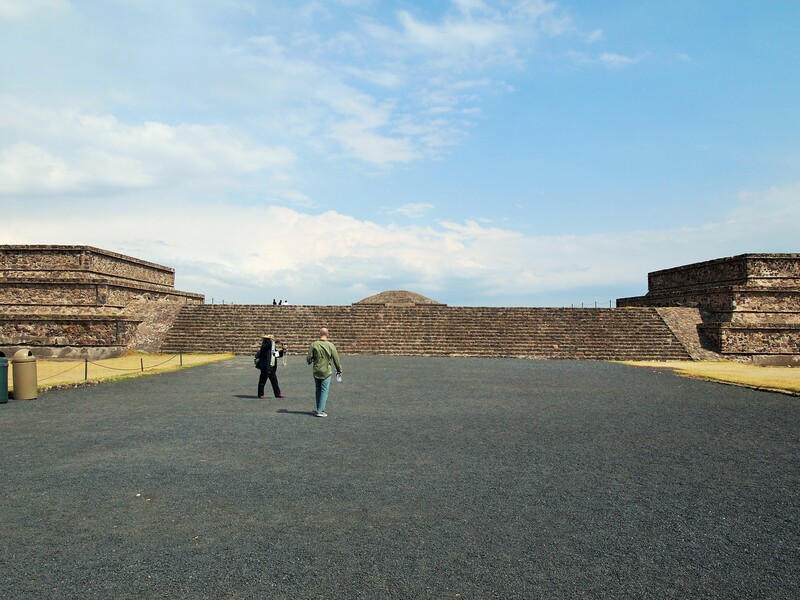 Today the avenue runs north-south from the Pirámide de la Luna to La Ciudadela, a 2.5 km stretch, though archaeologists believe it would have been another kilometer longer in Teotihuacán’s heyday. 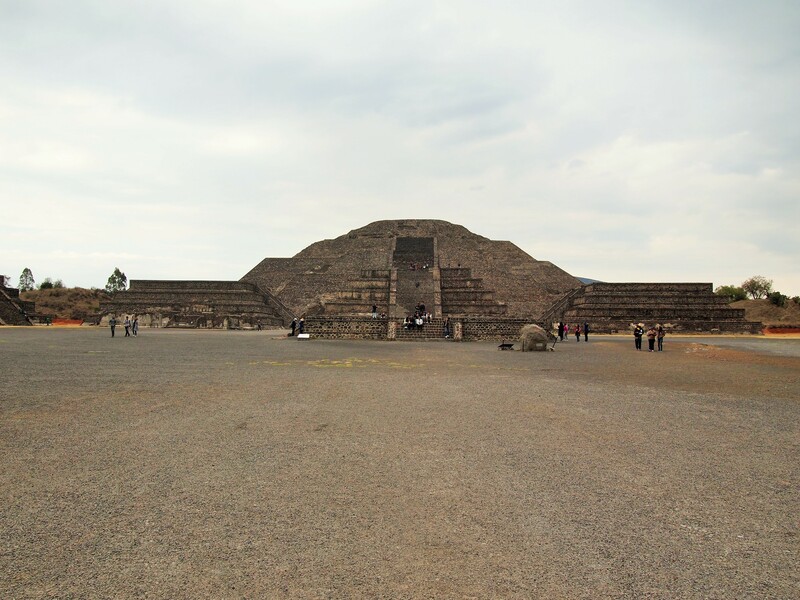 Platforms in the talud-tablero style line each side of the avenue with large plazas in between often with an altar in the center. There would have been residential compounds on either side of the avenue as well. 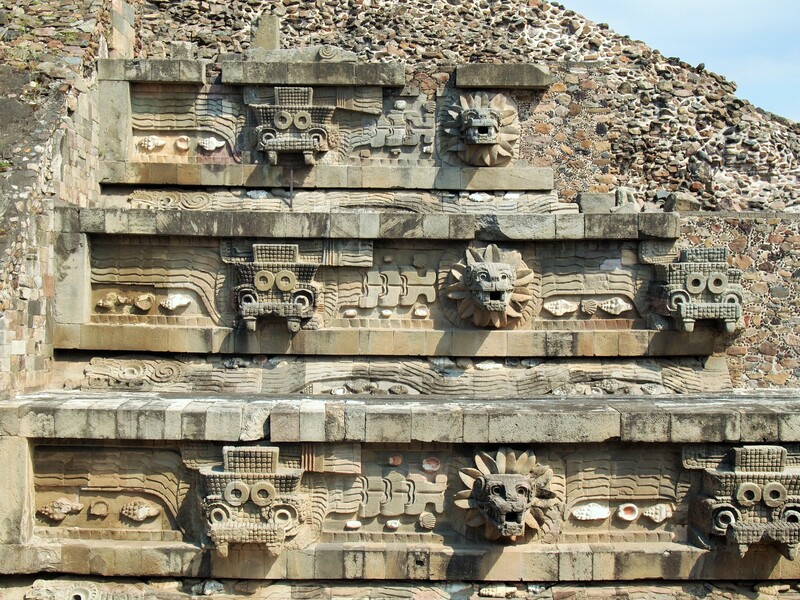 The layout of Teotihuacán is unique in early Mesoamerican cultures. 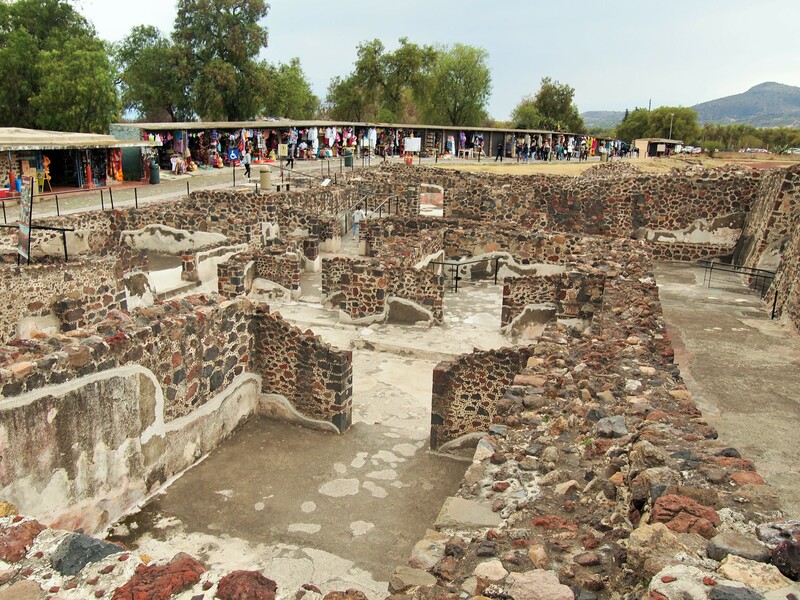 Most communities were built around a central public plaza, whereas, in Teotihuacán the city is arranged around the avenue. We arrived at La Ciudadela (the Citadel) unsure of what to expect. Frankly it seemed a little dull compared to the two pyramids. We ascended the first set of steps to find a large open area with an altar in the center and a platform behind it. It seemed almost like an amphitheater of sorts. We walked across the field toward the platform, taking in the enormity of the space. We decided to climb up the steep steps of the platform, anticipating the view from the top, unaware of what was on the other side. 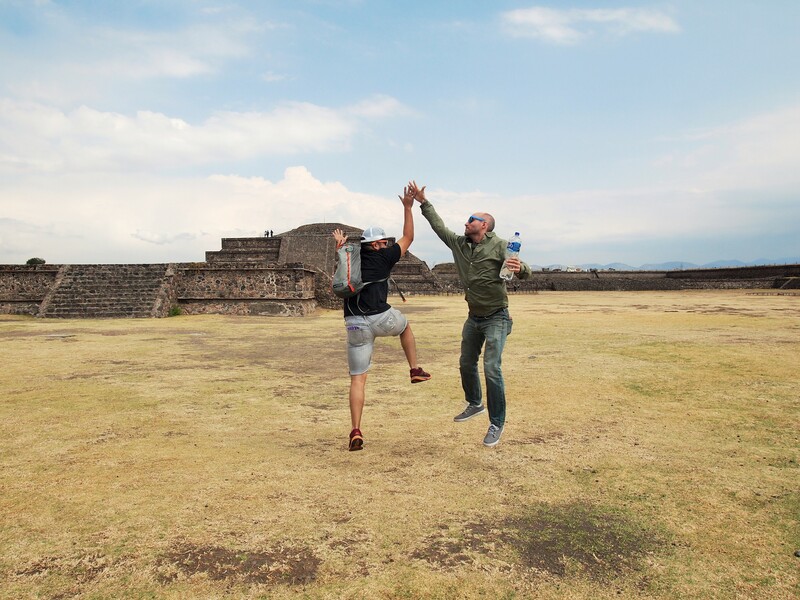 These guys just love pre-Columbian ruins! 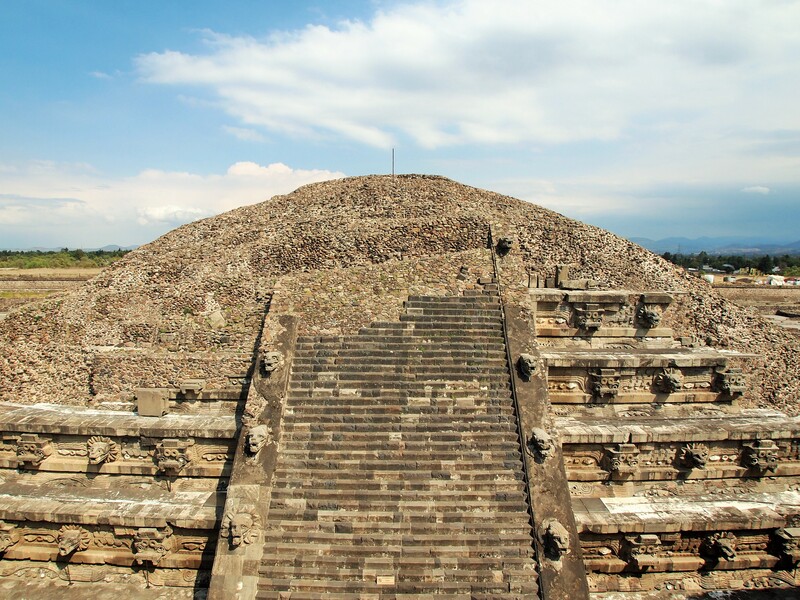 At the top, we were shocked to find the Templo de Quetzalcóatl in front of us. 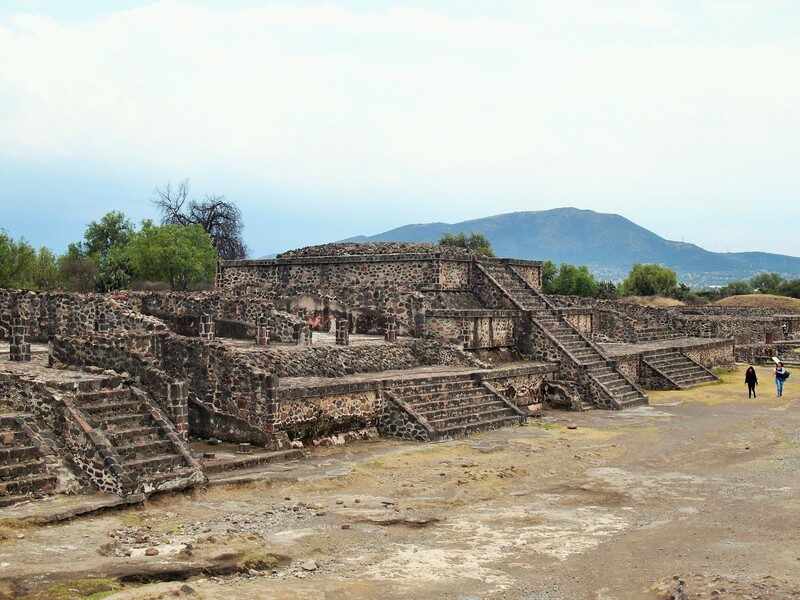 The Templo de Quetzalcóatl, or Temple of the Plumed Serpent, is the only fully original pyramid at Teotihuacán. The front is covered in elaborate carvings and statues. It’s stunning. It was so unexpected that I audibly exclaimed “whoa” once I reached the top of the platform. 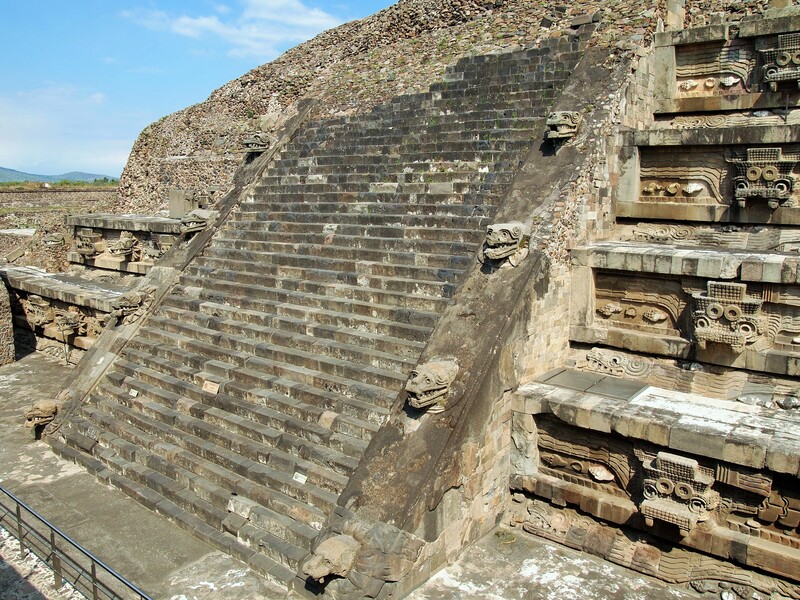 Added in the 4th century, the platform covered the main face of the pyramid and possibly helped preserve its sculptures. Visitors are able to descend the platform and get a closer view of the temple. There were only a few other people admiring the facade, several taking advantage of the solitude to sketch the sculptures. I was completely blown away by the intricacy of the sculptures; it was such a startling sight that it felt like we had discovered them ourselves. 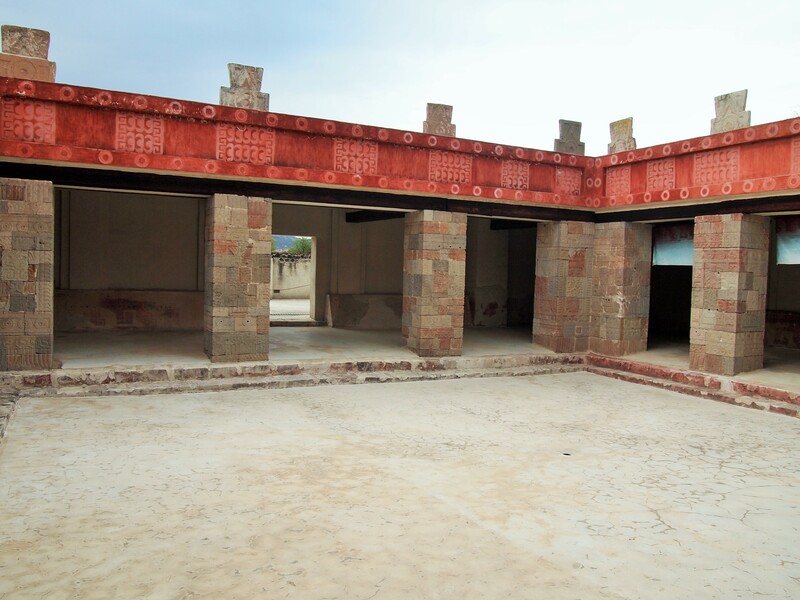 Archaeologists believe La Ciudadela was used for ceremonial rituals. 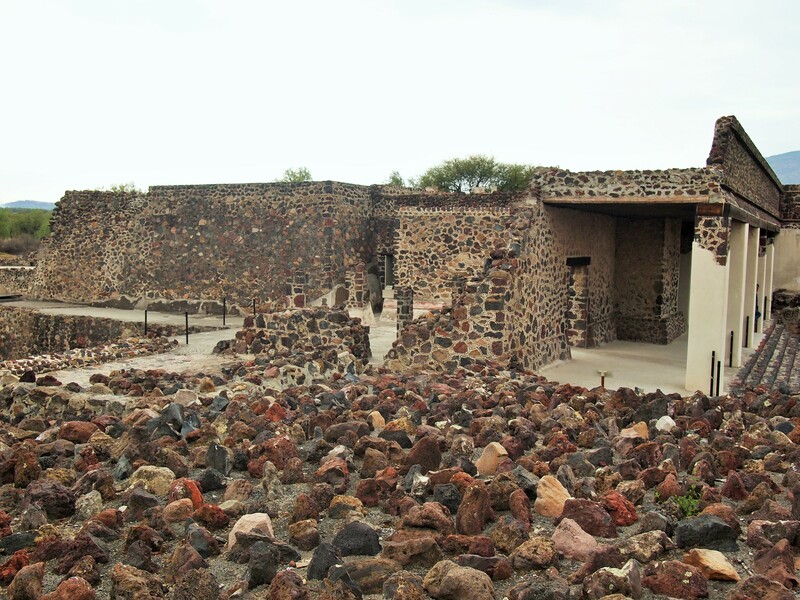 The space was large enough that it could accommodate the entire population and visitors – over 100,000 people. They have also discovered human remains, possibly sacrifices made during the construction of the temple. 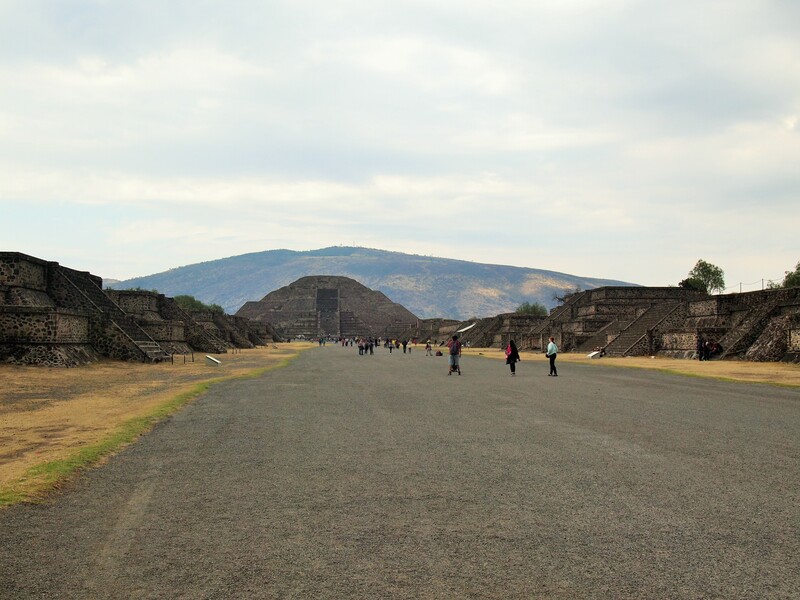 We walked back down the avenue to the Pirámide del Sol (Pyramid of the Sun). Standing a little over 200 ft. tall, it’s a massive behemoth. Even from La Ciudadela, it’s hulking form looms over the surroundings. 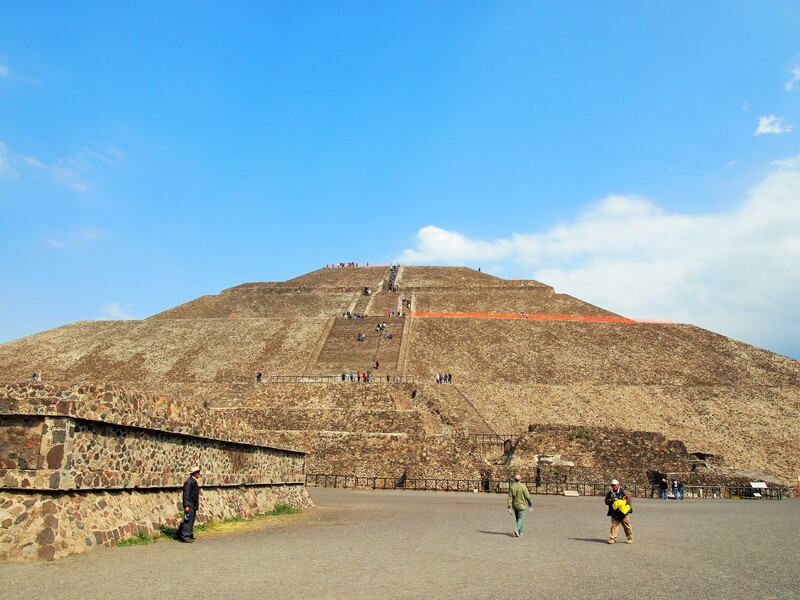 Its current name is due to 16th century accounts which state that the sun god was worshiped here. 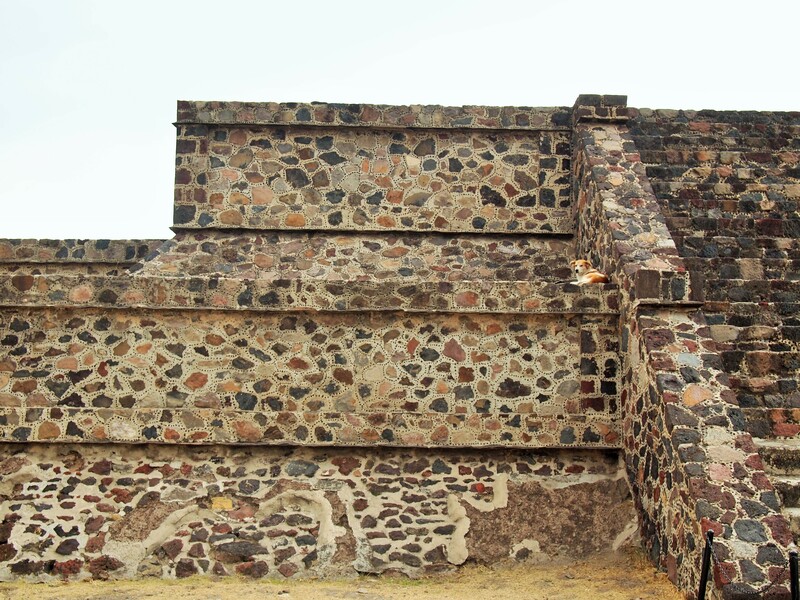 Though not entirely original – its outer walls were partially reconstructed in the early 20th century – the pyramid is solid and evidences three separate phases of construction. Archaeologists have since realized that in the reconstruction, an error was made; there were four terraces instead of the five now present. 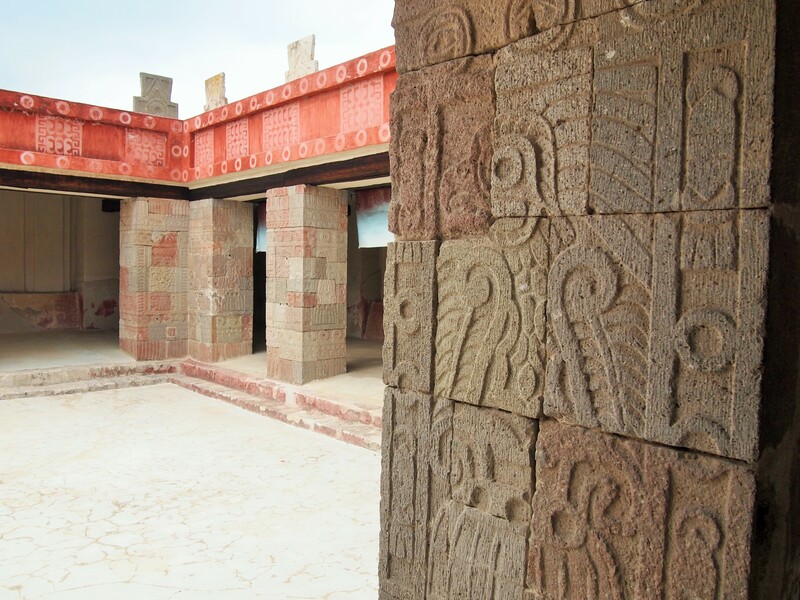 Originally, there was also a platform covering the main face – like at the Templo de Quetzalcóatl – and a temple at the top dedicated to the deity they worshiped. Tourists are allowed to climb to the top, although it can be slightly unnerving at times. 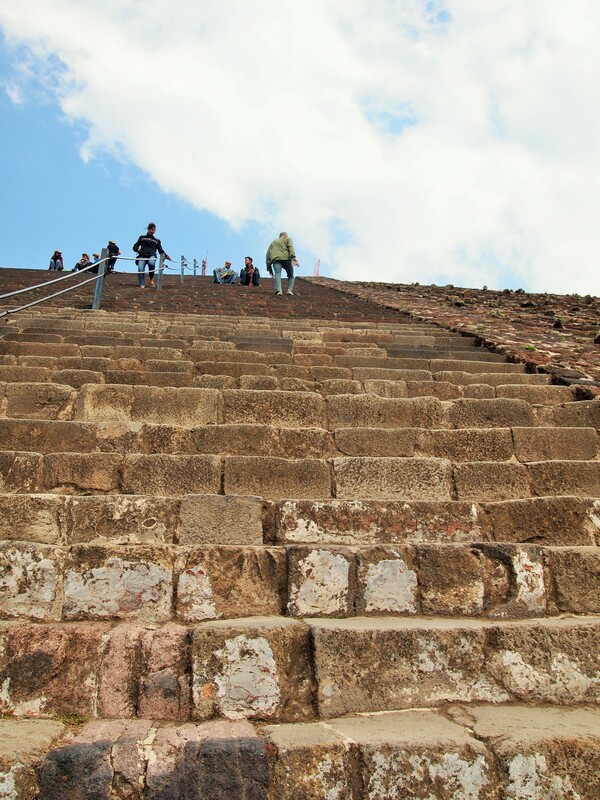 Some of the steps are quite steep; thankfully there was a guide rope of sorts to help steady your balance. The views from the top were extraordinary. 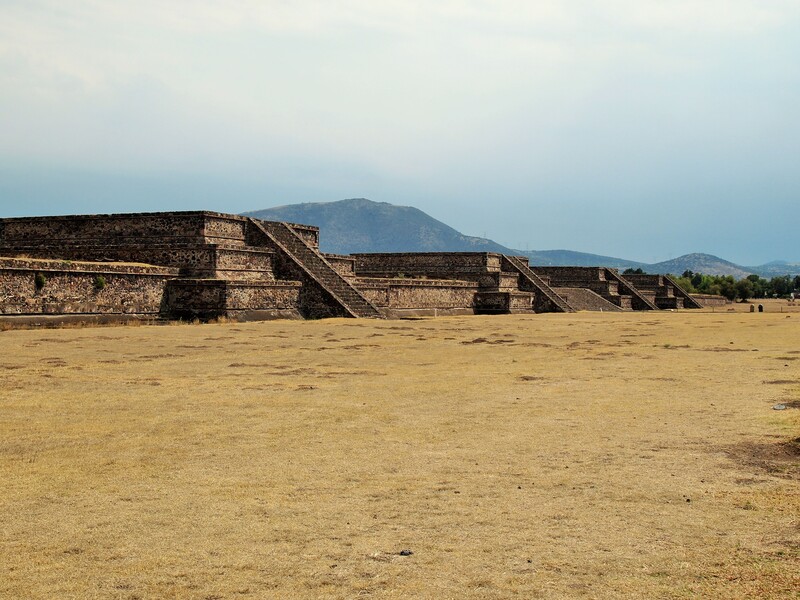 We could see more rain to the southwest, the entire length of the Avenue of the Dead, the Pyramid of the Moon nearby, and the surrounding homes and countryside. 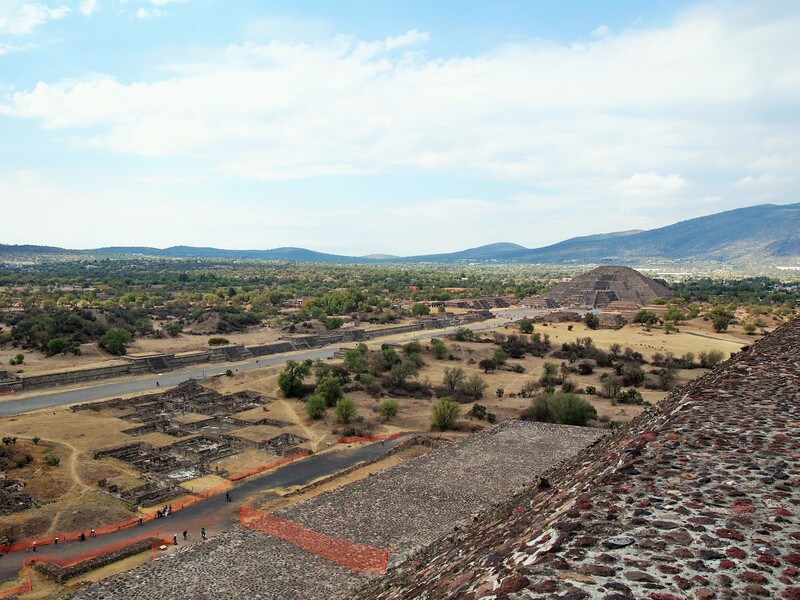 Our final destination was the Pirámide de la Luna (Pyramid of the Moon). The Avenue of the Dead is slightly different on this end. It looks more like an avenue for one – it’s laid out like a wide boulevard – and it doesn’t dip in and out of sunken plazas. 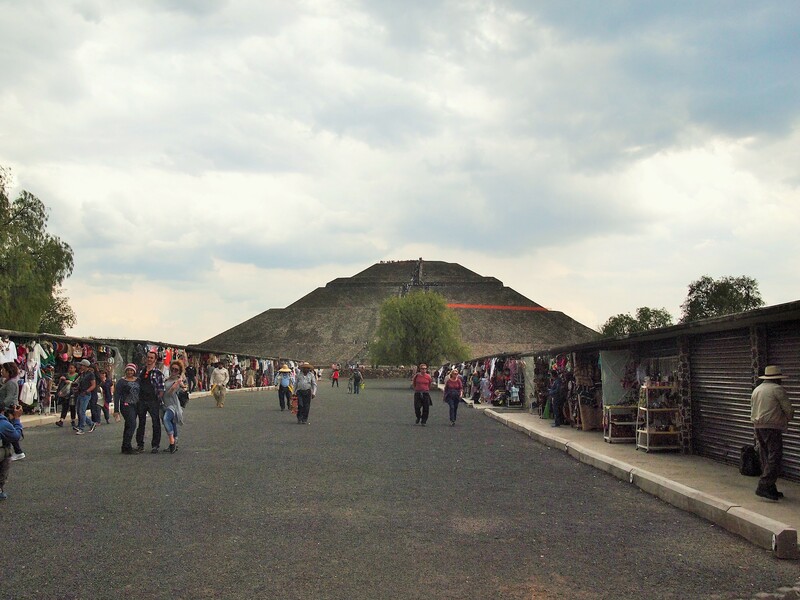 Additionally (and thankfully), it’s a much shorter trek down the avenue to the Pyramid of the Moon than it was to La Ciudadela. Along the way, there are hawkers trying to sell a number of different goods. Tim got caught up haggling with a blanket vendor for a while, but ultimately he didn’t commit. Along the avenue, we stopped to admire a mural of a puma. 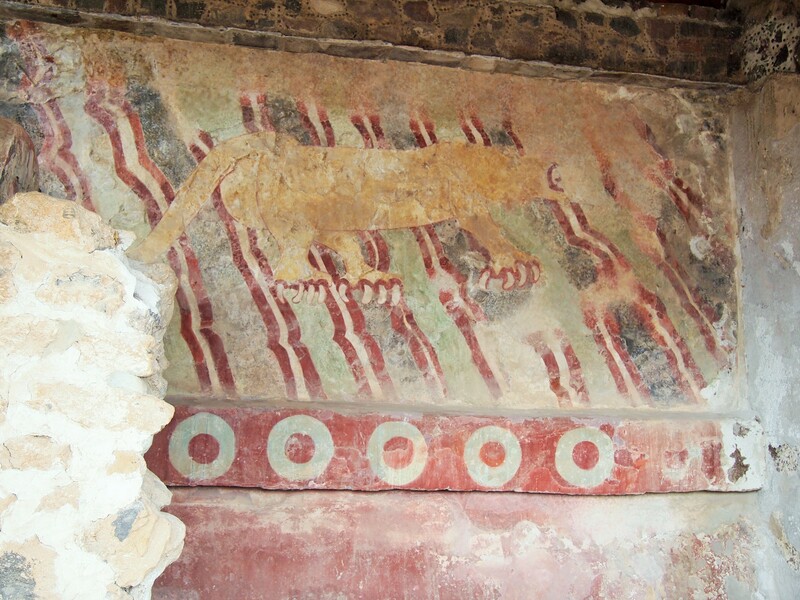 The mural was discovered in 1963, and is an example of the types of colorful decor that would have covered the platforms and temples along the avenue. There’s no head, but it’s easy to make out the form of a large cat and giant claws. We were pretty tired once we made it down to the plaza in front of the pyramid. 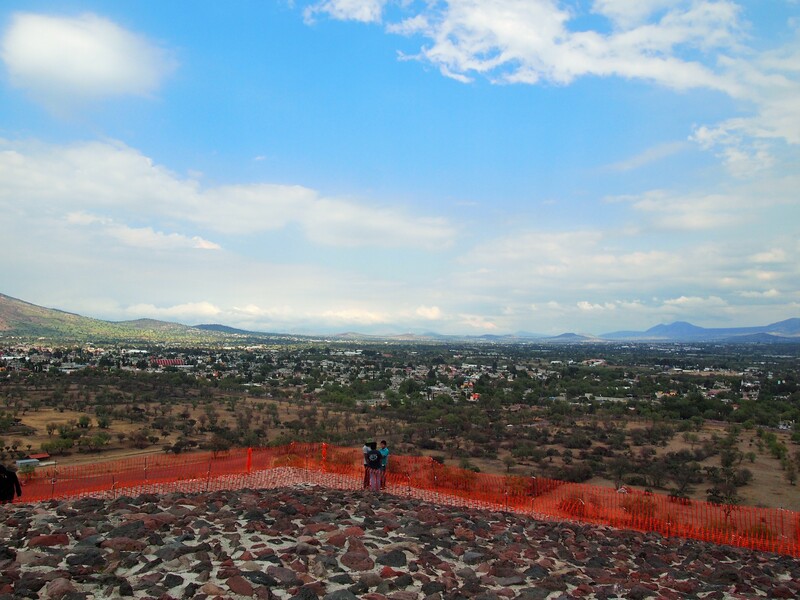 We decided that climbing up two pyramids was sufficient for us so we didn’t climb the Pyramid of the Moon. (Additionally it looked like you could only go up the first set of stairs.) From a distance, you can see that the pyramid lines up with Cerro Gordo, the mountain behind it. 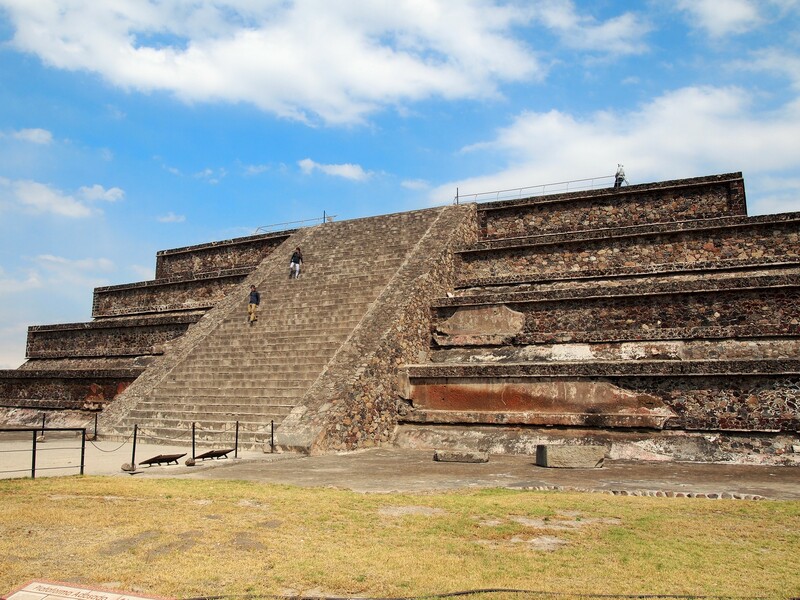 To the west of the plaza is the Palacio de Quetzalpapálotl (Palace of the Quetzal-Butterfly) which could have been the home of a ruler or the city elite. 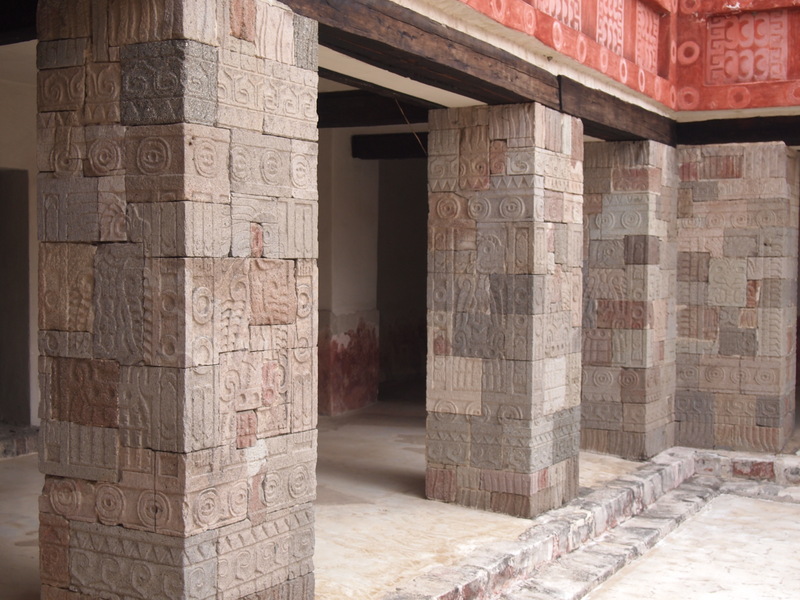 Inside there is a courtyard with elaborately carved pillars. 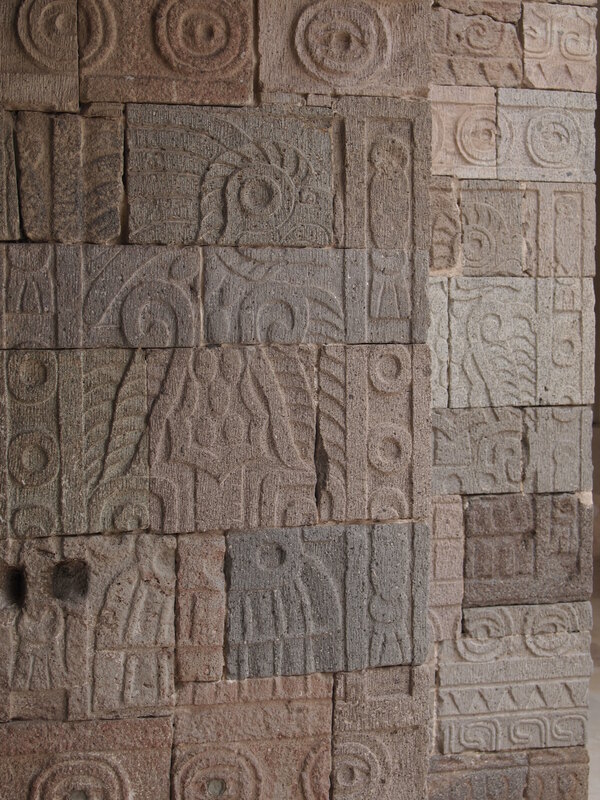 Each pillar has a quetzal – a bird with elaborate tail feathers – and an owl. Originally they would have been brightly painted as well. At first glance, you can’t even discern the carvings. But the closer you get, the more apparent they become. They are incredibly intricate. 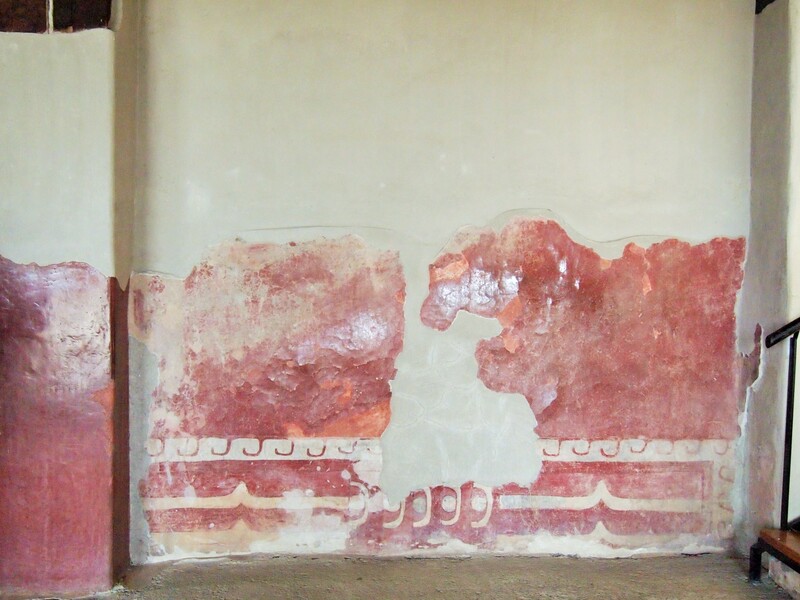 We missed out on a couple of the murals which have been uncovered near the palace. I thought we saw what our guidebook called the Patio of the Jaguars, but we didn’t. Oops. Next time? 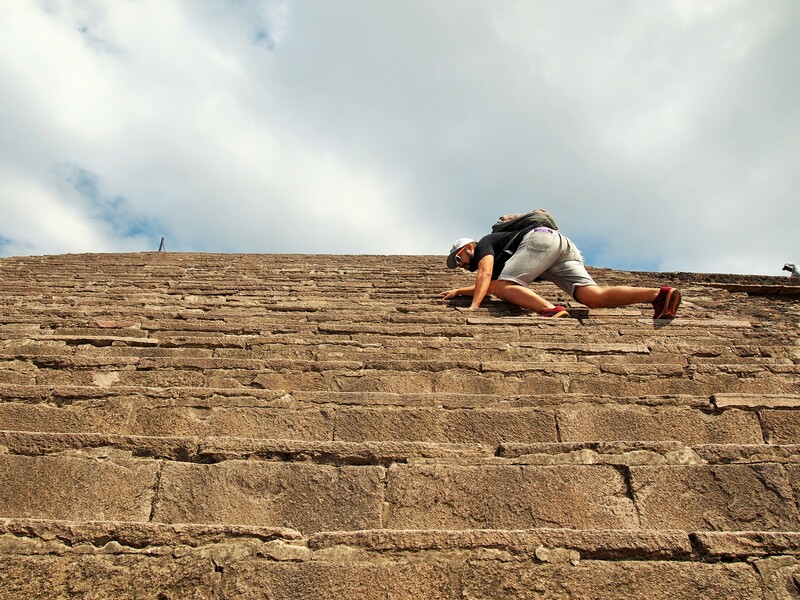 Teotihuacán was amazing and exhausting. We were all pretty hungry and tired and cold by the end of it. The wind picked up near the end of our tour and it seemed like more rain was on the way. We ended up eating at a food stall near where the bus dropped us off. It was still chilly, but it was great that we got some food in our bellies before the ride back. 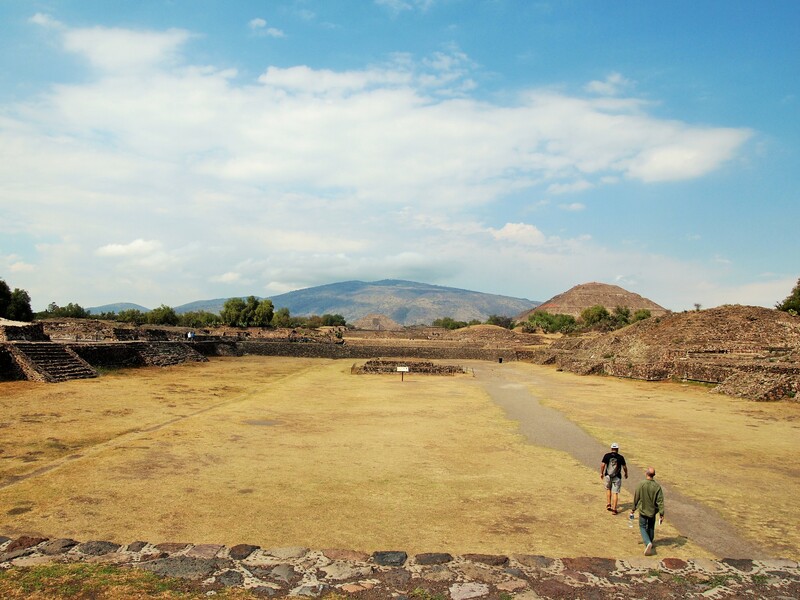 I’ve since read that Teotihuacán can get pretty crowded with tourists but that was not our experience at all. There were a fair number of people there, but it never felt remotely close to crowded. (We did go on a Wednesday so that probably helped.) 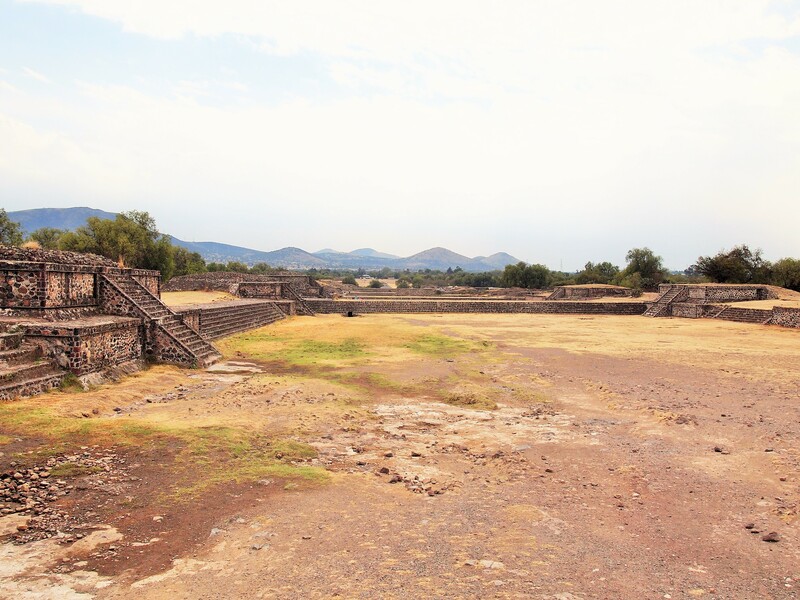 Teotihuacán was definitely one of the highlights of our trip, and I’m so glad we went!